Hello everyone! I've looked through the site many times over the last few years, and am very thankful for the advice and information that you've provided here. but am hoping you can give me more info! <This looks like... Anthopleura xanthogrammica, a cool/cold water animal. Thanks for the help! Do you know if they normally grow and reproduce very slowly? 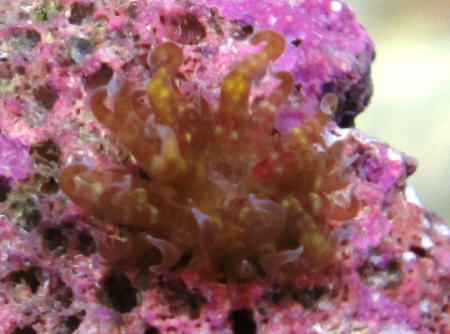 If it's a cool/cold water animal and in a typical reef aquarium, might the higher temps keep the growth slow? 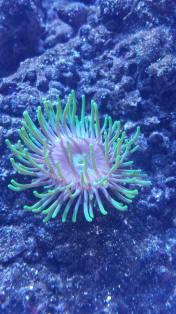 My anemone has been confirmed a bubble tip, although the professional I spoke to guessed it is possibly a very similar and related breed instead. I figured I'd let you know in case anyone else has a similar question. 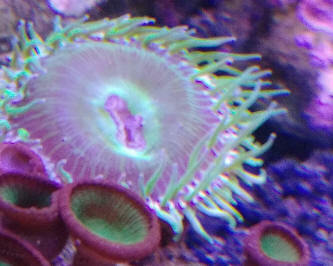 I have two anemones that have been present in my 75 gallon tank for some time. It was established late last summer, so it is a little under a year old. I was wondering if you could successfully ID both of these anemones. 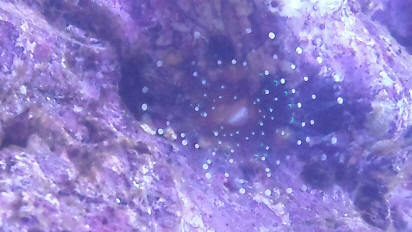 The first anemone is small and about the size of a nickel, with clear tentacles that each have a single small fluorescent green spot, ending in a small bulb tip, plus a brown stalk. 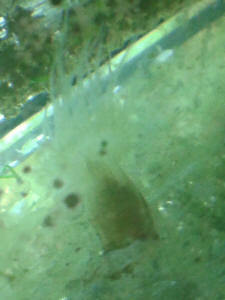 This guy came in on live rock and survived the entire nitrification cycle of the tank. I'm thinking that it is a Pseudocorynactis but was wondering if you agree? 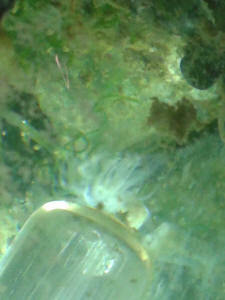 The second anemone is one that I have been unable to properly identify. It is about the size of a quarter with a tannish red disk and long bright green tentacles. It will eat some plankton or pieces of shrimp but seems primarily to be photosynthetic (makes sense given how vivid the green is). 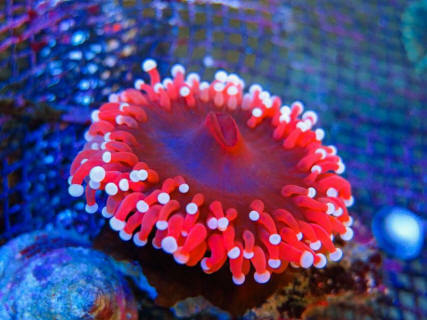 or an Aiptasia, plus the reproductive rate seems far too slow and geometric for it to be a pest anemone. 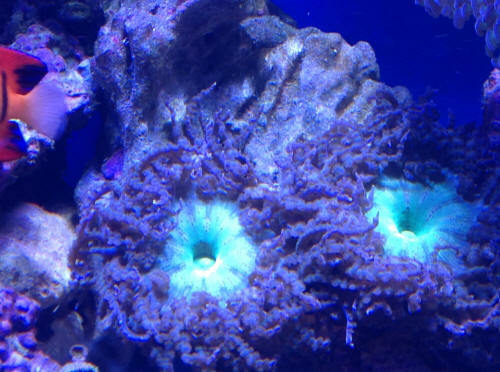 I've attached three photos, one with the original anemone, then when there were three, and finally how they currently are. 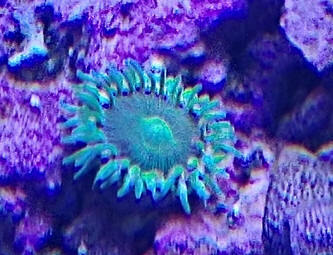 Do you have any advice as to how I can keep this anemone successfully (without it overpopulating)? I've been debating as to asking my local fish store if they'd be interested in taking a few of them off my hands. but I can't find any information or picture on it. I have attached a picture below, was wondering if by any chance you might know what it is or how difficult it would be to care for? and could not find this little guy. My tank is about six months old, and I started adding soft corals. I suspect it is a hitch hiker from one of the new additions; however it first appeared about a month ago on a rock which was purchased form someone who got out of the hobby (for unknown reasons). It seems to reproduce every week or so and are all a bit smaller than a dime. They definitely move around, and I would like to keep them if there will not be any issues. Any thoughts on what this may be? I have spent countless hours over the last month trying to identify this thing. The rest of the online community literally says to burn it/them. Thanks for your insight, I have been thinking about this for a couple days now. Would it be beneficial in my refugium? Apologies for the poor pictures, but these two are in my sump and it's hard to get a decent picture of them as the glass is obviously not clean. Aips or something else? I am trying to identify the mushroom or anemone in the attached photo. Can you please help me figure out a common name, possible scientific name and origin? 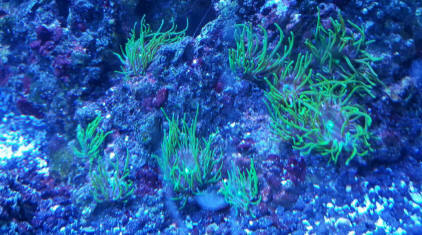 These animals have a bright neon green mouth with brownish/purple tentacles and are 3-4 inches each. <... the size, mouth/s... I do think this is a couple Heteractis aurora; likely from a bit of tissue "hitch-hiked" on something hard... live rock perhaps.